Why Day 0? Simply because the day was spent mostly travelling up from the South coast to the starting point at St Bees. It was a long journey involving a car and three trains, plus travelling across London by tube. It always amazes me how slick the London Underground is – so many trains running at the same time, all timed to the second, a constant buzz of activity, people and trains rushing everywhere with deadlines to meet, no time to ‘stand and stare’, a complete contrast to what I was heading for! The train from Euston to Carlisle was two thirds first class coaches – I joined a second class coach! My memories of this part of the journey were of a Scottish lady talking constantly for the three and a quarter hour trip, people talking on phones, bells and buzzes seemingly going off all around me. Joining the little coastal train at Carlisle was a culture shock – it was old and I’d swear it had square wheels as it was so bumpy after the north-bound train. It trolled its way slowly around the coast and finally pulled into St Bees station. I should say at this point that the miles quoted in my headings were taken from the GPS and were the actual miles walked. They often exceeded the distance quoted in the guidebooks because of the need to walk off the trail to find camping spots. Leaving the station, I made my way down to the sea front and the starting point for my walk. 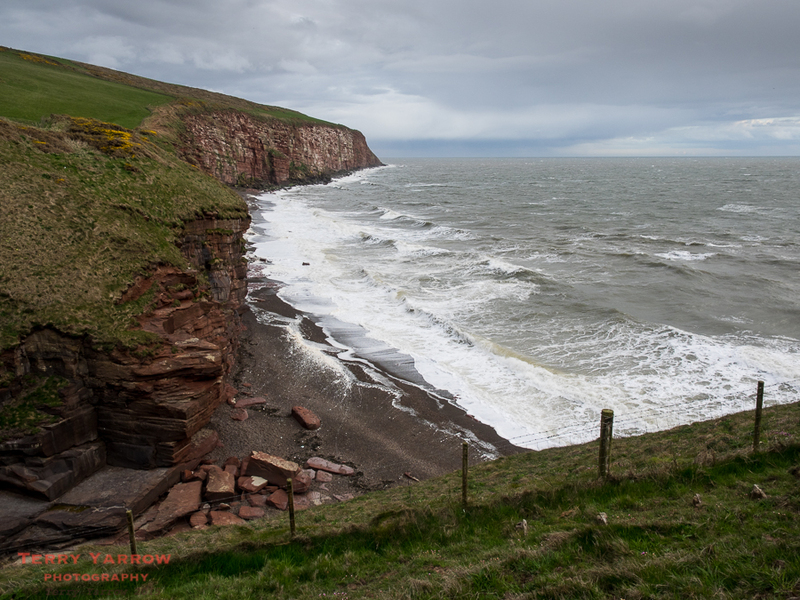 There was an increasingly strong and chill wind blowing off the sea as I made my way down the quiet country lane until finally, after a whole day of travelling, I had my first sight of the headland that would be my first miles of walking. 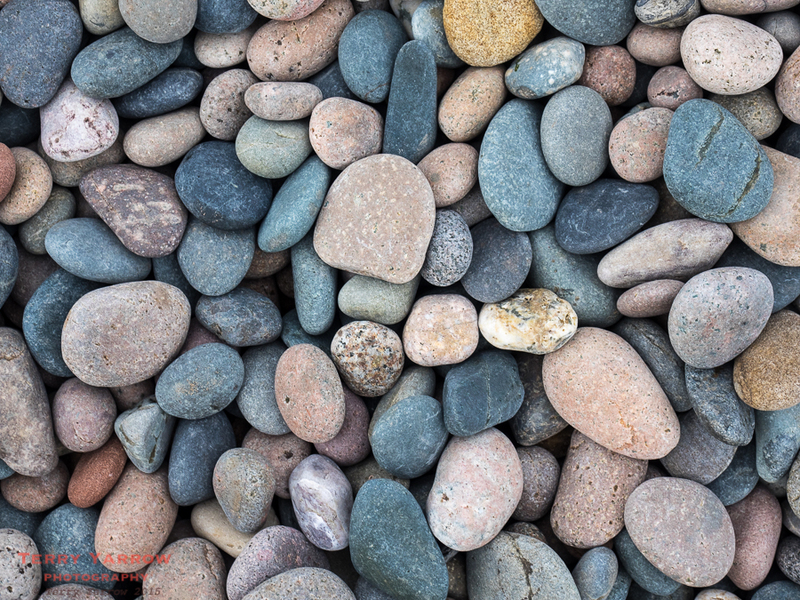 There is a tradition with the C2C walk whereby walkers first dip their toe in the Irish Sea and also pick up a pebble to carry across to the other side of the country – far be it from me to break with that tradition 🙂 ! 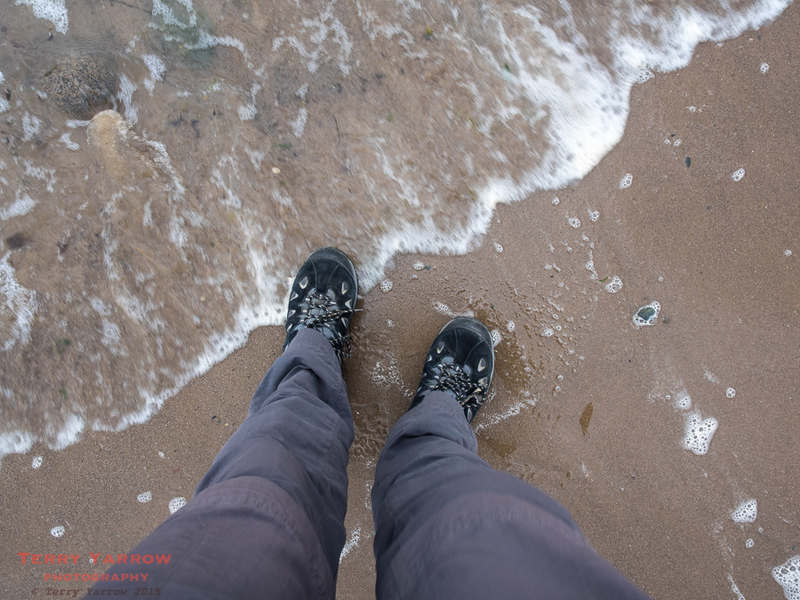 With the light fading and the wind increasing, I left the beach and started on my way, climbing up the headland that would form the first few miles of my walk. As it was getting late, I had already decided to spend my first night at a camping barn just three miles along the coast and with gathering clouds, I wondered if I would make it before the rain came. I turned and looked back across the bay just as a lovely but last burst of sunlight flooded the beach. There wasn’t time to stand for long so I continued over South Head and onto St Bees Head, passing Fleswick Bay on the way. 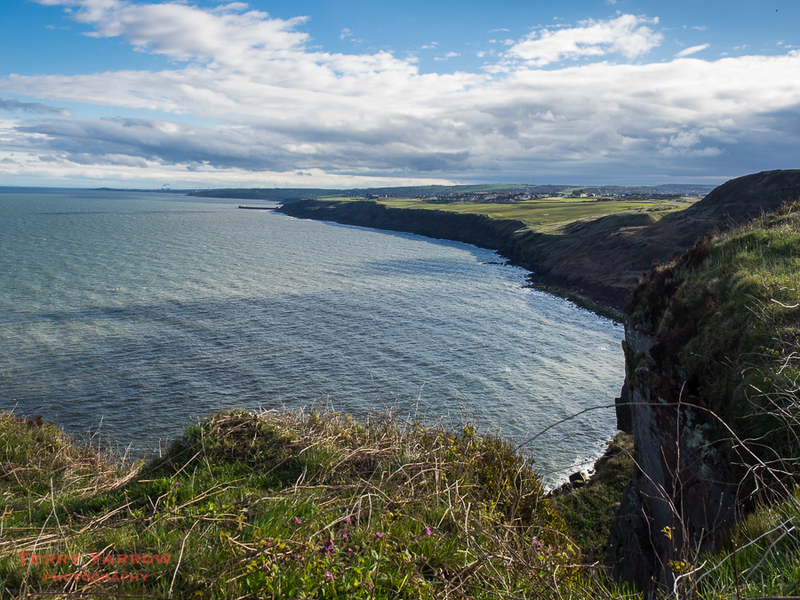 The sky was really interesting as I made my way along the cliff-top, buffeted by the strong side wind. The sun had set and there were some threatening storm clouds gathering. 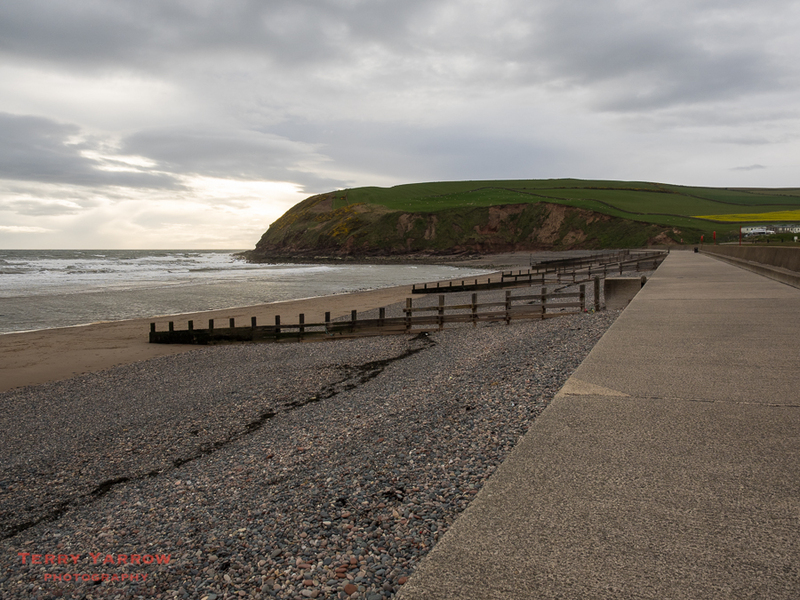 It didn’t take long to reach the St Bees Lighthouse where I turned inland to reach my stopping point for the night, Tarn Flatt Camping Barn and I walked into the farm just as the rain began to fall! The barn was a simple affair but perfectly adequate for my purpose. I asked the owner if I would have the place to myself as there was no-one else there and she informed me that there were two others booked in but who hadn’t yet arrived. I wondered who they would be and how we would get on sharing the sparse accommodation but I needn’t have had any concerns. Half an hour after my arrival, Matt and Ben walked in and we got on well from the start. They were two younger guys from Yorkshire who were over for the weekend to do the Cumbrian part of the C2C and they arrived by car having driven across after work. They had made convoluted travel arrangements to move the car around over the next few days as they walked the first 65 miles of the route. It wasn’t long before all three of us were tucked up fully clothed in our sleeping bags – it was to be a cold night! I was up at 6.00 after a fitful night – it always takes a day or two to adjust to the hard ground after the softness of my bed at home! After a quick cuppa and snack, I bade farewell to Matt and Ben although we were to meet again at the end of the day as we were all staying at Ennerdale Bridge the next night. I retraced my steps back to the lighthouse and turned North to continue along the coast with fine views across the Irish Sea to the Isle of Man. Very soon the coastline bends round and I left it behind to head inland, initially along country lanes. Almost immediately I had a foretaste of what was to come as there were ominous dark clouds over the distant Lakeland mountains, and snow on the peaks too. The local man in the picture below passed me with a cheery ‘Good Morning’ and he informed me that the weather was set to improve after the weekend – I hoped so as it was another cold and windy day! It was something of a relief to turn inland as it meant I had the wind on my back – which is of course why West to East is the recommended way to walk this route. The next few miles were spend traversing the coastal plain through Sandwith with the ever present view of the mountains to come, including Dent Hill which at 352 meters would provide a stern test later today (on the right in the picture below). Entering Moor Row, I passed the statue of Alfred Wainwright, the creator of the Coast to Coast walk. Walking through the village did highlight that there are shortcomings in all navigation and planning aids on a walk such as this – the guidebook stated that there was a cafe here and I was relying on it to get food for the day. However, a very friendly local informed me that the owner had had a heart attack and had to close the cafe some time ago. He also informed me however that there was a shop in the next village. Having read the guidebook, I was already aware that there were some notoriously difficult parts to navigate so I was carrying a strip map and compass, a guidebook, a GPS with the route loaded, and if all else failed, I had map software on my iPhone. I was to use all these navigation aids during the walk! Because this is not a National Trail, way marking is hit and miss and it is often only there because kind locals have painted marks on posts and fences. I continued to Cleator where I found the village shop – very timely as not too far away was the steep climb up over Dent Hill. I would need that sustenance to help me there 🙂 ! Leaving the village, I immediately missed a turning but fortunately another local resident called out, informing me that every walker misses that turning – clearly my 20 Kg backpack gave away the fact that I was walking the C2C 🙂 ! This does highlight something very positive about this walk though – just the friendly and helpful nature of the people you meet along the way. I stopped for a short time at the foot of the hill to eat lunch and then started the climb upwards. After the relative flatness of the preceding miles, the climb came as a ‘shock’…….there would be many of those to come over the next two weeks! The views from Dent Hill were amazing and I was glad the sun had lingered long enough for me to get some pictures. On a clear day it is possible to see Scotland, The Isle of Man, and even Ireland. I drank in the views for as long as I could but the wind whipping across the top was bitter so I moved on. With the sun gone, the top of Dent Hill is quite bleak and I made my way across, getting ever nearer to those distant mountains. Reaching the other side of the hill, I came across the mega-stile in the picture below. It is built like this to enable walkers to cross the deer fencing which runs around the hill. You almost feel you need oxygen to help you get over it 🙂 ! The drop down the other side of the hill through Raven Crag, which is actually a grassy hill, into Nannycatch (dont you just love these names!) is extremely steep, in fact it is the steepest part of the whole trail. As I climbed down, I wondered what it would be like to climb up if you were doing the trail in reverse! The views across the valley were spectacular though and I wondered who lived in a house like the one in the picture below. Is there a more idyllic place to live?! It was something of a relief to reach the valley bottom, and what a delightful valley it was too! Nannycatch Beck babbles its way through the valley and the path follows its route closely. Being sheltered by hills on both sides, the keen wind was felt no longer and I thoroughly enjoyed quietly and slowly walking along the valley floor to the lovely sound of birds and brook singing together. Eventually the path reaches the road that winds down to Ennerdale Bridge but before leaving this idyllic valley, I couldn’t resist turning for a last time to look back down the way I had come. I feel that I should mention sheep at this point…….there are a lot of them…..all along the route 🙂 ! When I was young, I used to dream of being a shepherd so this just added to the delight of this walk. Herdwick sheep are prevalent here because they are one of the breeds that can take the severe mountain climate and vegetation without hardship. They are also territorial so don’t stray from their own fells which makes them ideal for the Lake District even though their wool is not the best. For me, they are definitely a positive part of the amazing Lake District scenery. I made my way down the road into Ennerdale Bridge, my stopping point for the night, and headed for the local pub where I pitched my tent in the beer garden. Later that evening I met up with Matt and Ben again and we spent a great evening together. This is another feature of this walk – the almost ‘community’ feel to it as you meet, chat and walk with many other walkers. It was dark and cold as I later made my way to my tent but I didn’t know then quite how cold it was going to get! Tomorrow would see me in the Lake District mountains and I fell asleep wondering how I would cope with carrying my pack over greater heights than today! Hello Terry, We have just enjoyed your first instalment of the C2C. Loved the pictures and can’t wait for day 2! How did you find the 5 days in the Lake District? Were your experiences much the same as mine? Actually, ignore me – of course I know where Catrake Force is, seen it many times; I didn’t recognise it from the camera angle! The Lakes were stunning. I’m glad your pics show there are still beautiful views to come! The weather obviously spoilt some of it for me but I’d say the only bad bit is the flatlands when you cross the Vale of Mowbray – between Richmond and Ingleby Arncliffe. You get some great views from the North York Moors. Ah, that explains it. I wasn’t intending to stop at Grasmere originally. And like you, I had to resort to my iPhone a couple of times :)! Just before I received your comment I realised I had made a mistake with that caption. The picture is not Catrake Force at all, its Rainby Force which is right beside the Keld Bunk Barn and Yurts which is where I camped that night. Probably explains why you don’t recognise it :)!